Growing up, I steered clear of William Faulkner as long as I could, a major feat for a writer born and reared in Mississippi. I guess I read “The Bear”, “A Rose For Emily”, or “Old Man” during high school sophomore English class. Probably “A Rose For Emily”. It seems the most appropriate for that age, and, having discovered Edgar Allen Poe the same year, “A Rose For Emily” would have stuck in my mind for the macabre alone. I know well, though, the book which caused me to run away from William Faulkner — As I Lay Dying, soon to be a major motion picture release. Each student in my senior English class had a choice between one of two books as an optional reading requirement; I cannot remember the other option, but, then and now, it seems pedestrian next to the idea of Faulkner’s ode to family, death, and struggle. The story seemed straight-forward until I reached the infamous chapter in which Vardaman, youngest member of the family, declares only, “My mother is a fish.” That’s it, the whole chapter; no explication, no exegesis. I did not yet have all the critical tools to deal with it, the three things Faulkner himself said every writer needs: experience, observation, and imagination. So, ignoring the fact he also said at times any of one of those things would suffice for the others, I flew my white flag and declared the author obfuscating for the simple expedient of appearing difficult. Besides, I had found another Master, one of complex insights housed in seemingly simple vessels — Ernest Hemingway. Hemingway’s minimalist style proved more accessible to my immature intellect, while the international settings of his novels and stories inspired a young mind seeking an escape from, not deeper into, the humid, kudzu-ridden South of its youth. In this way, I spent my upperclassmen and undergraduate years devouring The Sun Also Rises, For Whom The Bell Tolls, A Movable Feast, and whatever other Hemingway I ran across. I also wasted a major opportunity to penetrate the works of Faulkner. Noel Polk, one of the foremost Faulkner scholars of his time, taught classes at the university I attended and, though I knew him, I avoided his classes concerning the most famous novelist of my home state, due in some part to my accepted difficulty with Faulkner’s work, and perhaps due, in some part, to my roommate being an ardent Faulkner scholar. We would have vehement arguments — my roommate and I, not Professor Polk and myself; that would’ve been ridiculous — wild, adolescent, undergraduate debates of “Who’s the Better Writer”, he always defending Faulkner and me Hemingway. His defense consisted of Faulkner’s complexity versus Hemingway’s simplicity, while contending that Hemingway could not write a Woman. I, meanwhile, argued Hemingway wrote symbols, not women, Faulkner’s complexity made his work impenetrable and that, anyway, he could not punctuate his way out of a paper bag. Oh, the hubris of youth. So, with one of the finest, kindest educators in my experience, not to mention one of the most renowned Faulknerians, at my disposal, I steadfastly refused to engage the author and retreated further and further into Minimalism, mistakenly assuming that it owed some allegiance to Hemingway. Ultimately, though, I had to admit Faulkner intimidated me. The first book of his I read contained this alien and quixotic sentiment, meaning one thing or another, depending to whom you listened, and my undergraduate roommate gave me to understand what I had read in high school represented the easy stuff. There were others — The Sound and The Fury, Absalom Absalom, for instance (confession: I still have not read that last one) — which to the uninitiated remained as impenetrable as Calculus. A funny thing happened, though. The year after taking my Master’s, I moved to Oxford, MS. Faulkner fairly floated, like pollen, on the air. Most importantly, I walked his landscape, his terrain. I picked up pieces of him here or there, scraps of his letters, telegrams back and forth between himself and his Hollywood employers, his thoughts on various employments, or lack thereof, on his little “postage stamp of soil.” Then, I picked up The Hamlet, the first of his Snopes trilogy. Here, then, lay a story I could understand, the Have-not on his way to becoming a Have, being generally sneakier, slicker, and downright meaner than anyone standing in his way and, ultimately, losing. 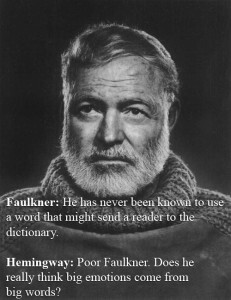 Through Flem Snopes, I came to appreciate Faulkner’s themes and language. I’m sure my own critical tools matured in the ensuing years, also, but the Snopes Trilogy gave me a backdoor into Faulkner’s more experimental work. I came to appreciate his legacy and his place in Literature’s Pantheon (as much as I hate the idea of a canon). Though I’ll never use language as dense as Faulkner’s, or as deceptive, I understand the larger point behind the books set in his Yoknapatawpha County, that great themes can be played out on small stages, that there are no new stories, only telling them well, and that what a writer must do more than anything else is care, deeply care, about the characters who embody his or her stories, regardless of their ultimate outcome.